Achieving the Achilles Category B1 Audit certification is more great news for Inova Gates Ltd! 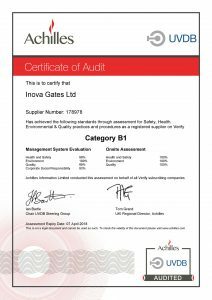 It means our clients can continue to have complete assurance that Inova Gates Ltd operates to the highest Quality, Environmental and Health & Safety standards, while continually striving to maintain and improve these standards that set us apart. We are incredibly proud of the Inova Gates team who have continued to work extremely hard to make our investment into these key standards a reality. It required strategic operational reviews, some significant changes and the addition of new processes and procedures to embed these new standards into the very heart of our organisation. 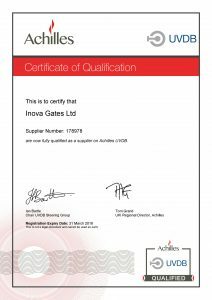 This will help Inova Gates Ltd enhance and maintain the highest levels of service quality that today’s business environment demands; and through the ongoing Achilles and ISO auditing programmes we will be able to ensure our clients that they are always in certified safe hands. Inova Gates Ltd have always been committed to providing the best quality service possible and we take security very seriously. Our new standards will provide us with the badges of honour we deserve and the assurances our clients expect. This is a milestone achievement and one that reflects Inova Gates Ltd continual growth and development as a leading Security Gates Specialist.